The Disney Cruise Line does a lot of things right, but the Kids Clubs may be the crowning jewel. I have a unique perspective on the kids club. I can actually say I experienced them as a kid and as the parent. On my first cruise I was 16 years old, it was the fall of 1999 and the Magic hadn’t been sailing for a year. My cruising party consisted of my parents, and 4 siblings. Once all of us were introduced to our respective clubs it was hard pressed to get us out. The three oldest had a blast in the Teen Club. We did all the group activities, went to the Teen Beach and met friends that we then stayed connected to for years to come. My little brothers had a similar experience in the kids clubs. Fast-forward 16 years (don’t do the math!) and I have my own little one. Being in the parent seat came with much more difficult questions then “will I meet cool people, how many virgin daiquiris can I drink?”. I have an only child, she was going to be by herself, she wasn’t going to have a built in friend network that she could play with like I did. So I had concerns just like any parent would. When I was 16, we had the run of the ship. I knew my 5 year old couldn’t do that, but I wasn’t sure what she could do and how tight the security was. I am happy to report that they take this very serious and I never felt that her security was questionable. She was given a band (just like a magic band) that tracks her whereabouts within the kids club. For pickup you are scanned in using your key to the world card. And you are told where to find them based on the band’s information. In order to take her out of the club, they will scan her band and your key card and you must provide a pin before you are allowed to exit. *This is a process, so be patient and allow time to get them in and out of the clubs. I was concerned that she would feel a little lost in the large space.. But in our case, the staff did a wonderful job. When pick-up came around she was almost always with a counselor. And if she was not directly with a counselor there was one nearby. Of course this was not a huge concern, but I did wonder if she would get tired of being in the same space. No need to fear, she participated in so many planned activities throughout the cruise, that she never really did just sit and play with the things in the clubs. I was blessed to have a child that not only loved the kids clubs but did not want to leave them. She picked to go to the clubs over the pools on a regular basis. She participated in everything she could. On the last day she broke my heart saying goodbye to her counselors. Show them video and pictures of the club before you leave. Take them into the clubs during open house. Don’t just walk through, spend time with them there so they are comfortable. Take them during planned activities. Get them excited for something that is right up their alley, video games, baking cookies, Pluto’s PJ party, the list can go on and on. If it doesn’t stick the first time, try again! I truly believe they will miss out if they don’t go! Click here for more Disney Cruise Line information. Castaway Cay is Disney’s own private island, pronounced Castaway Key. Why wouldn’t they own their own island?! It is a must do when cruising in the Bahama’s or Caribbean. In fact I would go as far as to say if you are taking a cruise in one of these locations you should NEVER not stop at Castaway Cay. Imagine, a picture perfect island that is only for you and your fellow passengers. No peddlers pushing their wares as you get off the boat. No taxi hopping to get to the nearest beach. No searching for food. All of it is taken care of for you and the setting is magical. Family Beach – This beach is a huge white sand beach with tons of beach chairs, umbrellas and activities. Pelican Plunge is right off shore and has water slides, floating platforms with buckets that dump gallons of water on you and water cannons! Spring-a-Leak is a water playground that is partially shaded and is a great place for toddlers to play in the squirting water! Serenity Bay – The adult only beach is just a short walk or tram ride away. A truly serene beach that features amazing hammocks, plenty of beach chairs and relaxation. Teen Beach – I actually remember going here as a teen (now those were the days). It’s a great spot to hang out with the friends you have made on the ship, play beach volleyball or other games and swim in the crystal clear water. There are plenty of things to keep you busy on the island. Swimming – which includes snorkeling! My recommendation is explore the island. Take the time to look around, take a walk or rent a bike. Disney treats their island like one of their parks and they pay attention to each and every details. Great news! Dining on the island is included in your cruise fare. There are 3 dining spots on the island. Cookie’s and Cookies Too are located at the Family Beach and Serenity Bay BBQ, is you guessed it, located at the adult only beach. The food is great, featuring fresh fruit, picnic favorites like hamburgers, hot dogs, chicken and potato salad. There are also soda fountains and ice cream located at each. The kids club moves from on the ship to Scuttles Cove. At first I was not sold on the idea. The plan was to spend the day as a family on the beach. Our last trip was in January, and the water was COLD! This may not always be the case, but it was very chilly in the water. By lunch time she was begging to go hang out with the other children. Now don’t worry, this area is far away from the water and completely secure. But still bring them in their swim suits. There is a sandy play area and water elements to keep them cool. Our little one had lunch in Scuttles Cove and we headed to Serenity Bay to have lunch and enjoy ourselves with a long nap in one of the hammock. I of course should not have doubted that Scuttles Cove was going to be anything less then stellar. She had a blast and it was great to have a little downtime to ourselves. I am going to be transparent about this subject. I have never rented one and I have never even been inside a beach cabana. I am torn on the GREAT BEACH CABANA DEBATE. These luxury private cabanas offer seclusion, views, shaded lounging space and a stocked beverage cooler (non-alcoholic). But at a VERY expensive price tag. At over $500 for the day on the family beach, the debate is real. Is the luxury worth the cost? I can tell you we haven’t made the plunge. It’s being debated for the next trip, only because it can be split between 3 families. But even then, I probably would rather a hot stone message, but that’s just me. When should you get off the boat? You will read everywhere that you need to get right off the boat so that you get the first pick of chairs. We found that the boat is very slow moving in the morning. We did not rush, but had breakfast and we disembarked about an hour after the all ashore announcement. We had no trouble finding perfect chairs. We were on the Magic, which carries less passengers then the Fantasy. If you have a big party and you need 10 beach chairs together in the perfect spot, I would get off early. If not, don’t feel rushed getting up and out. If you would like to snorkel, consider bringing your own equipment. This will save on rental fees. Or opt for the package that includes an inner tube. If you are up for it, take a bike ride. The island is very flat and it’s beautiful to explore. Disney as always works to create the perfect experience for their guests. And Castaway Cay is a picture perfect piece of paradise. 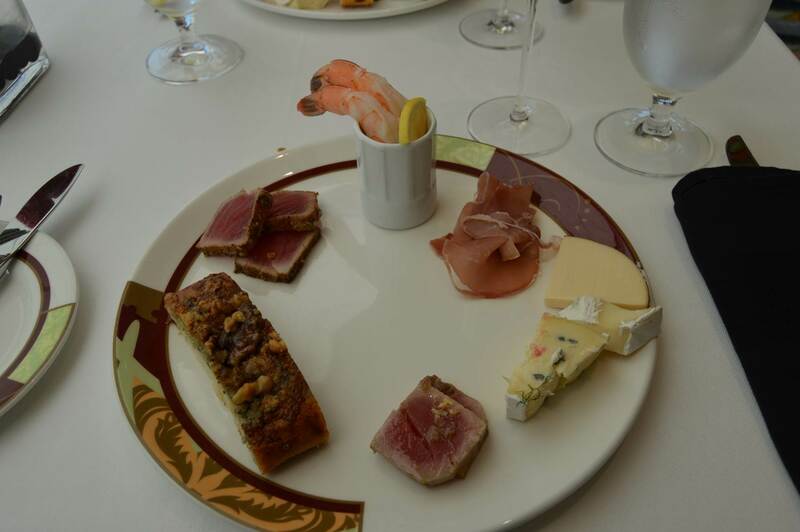 When you think about a cruising vacation, one of the first things you think of (besides the beach) is food! And DCL certainly does not disappoint. Table Service – each ship has 3 restaurants that offer your evening meal. As with other cruise lines you are seated at the “same” table with your nightly wait staff. The Disney difference is rotational dining! Instead of being in the same dining space every evening there are three restaurants that will rotate throughout your cruise. 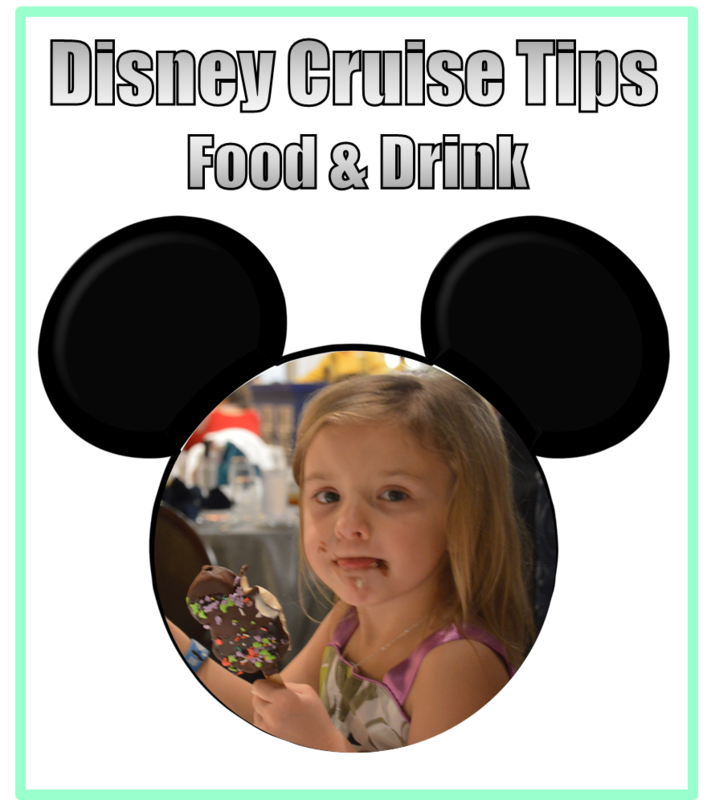 For the purposes of this post we will focus on the Disney Magic dining rooms. Animator’s Palate (All 4 Ships) – Is a not to be missed spot to dine. This interactive dining will be a huge hit for both adults and children. If you are lucky you will be within these walls twice during your cruise and you will be able to experience the addition of color to the space and seeing you own character come to life on the screens. Lumiere’s (Magic) – Is a beautiful spot to enjoy an upscale meal with a French flare. To enter you ascend the stairs off the atrium and you feel like royalty, Belle and her Beast to be specific. 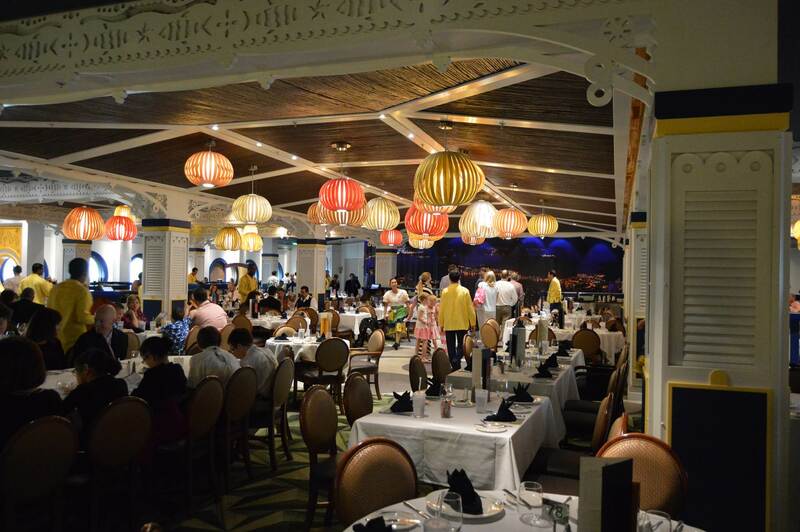 Carioca’s (Magic) – offers South American inspired cuisine in a setting that is reminiscent of The Three Caballeros. *To my knowledge at the present you cannot request a certain dining rotation. However, you may get lucky and be able to do so on embarkation day at check in. To find out what your rotation is, you can look at your key to the world card and it will be noted in an acronym on the front. Buffet Dining – If you are looking for all you can eat as far as the eye can see then Cabanas is the place to be. We frequented for both breakfast, late night fare and the occasional lunch. Counter Service – If you aren’t full yet, each ship has quick service meals around the pool. Featuring, burgers, tacos, hot dogs, pizza and more you are sure to find something to please. Grab a bite and head to the pool deck to enjoy fun in the sun. Or grab a sandwich and fruit to pack in your bag for a lunch off the ship. Adult Only Dining – Palo (All 4 Ships) and Remy (Fantasy & Dream) are adult only spots that while are an extra charge are worth the splurge. **Tip** if only scheduling one adult exclusive go with brunch. It’s a great way to experience the restaurant but not miss out on the rotational dining. Room Service – This is free….for the most part. Soda and bottle water is not free and will be charged to your account. You will also be expected to tip accordingly. The room service staff is not tipped at the end of the cruise like your other hosts. Mix and Match! – You can mix and match menu items. At dinner, try two appetizers. Have a soup and salad, then two desserts. Go wild and try something you have never had before. Don’t be shy! Early vs Late Dining – there is a very large debate about which dining time is the most preferable. I have found that the late dining crowd is very vocal about the pro’s of late dining and how terrible early dining is. I am hear to tell you I DISAGREE! Late Dining – Does have less children and does allow for more time on shore. BUT you are more apt to skip the entertainment, you are more apt to not dress up and you are more apt to miss out on the photo opportunities. Plus I don’t know about you but 8:15 is very LATE and a 2 hour dinner means you don’t finish up until after 10! Early Dining – Does have more children and does mean that you need to get back on board at a reasonable hour in order to get changed. BUT you are wide awake and not starving (or full because you had a huge snack), your children are in better shape to get the most out of the meal, you are prepared for pictures before and after, and you are ready and waiting to get a great seat for the nightly entertainment (which is a must)! I also have strong feeling on this subject, and I will probably forever be an early dining sort. I do not like to eat at 9:00pm, with or without my child. And I am a creature of habit. I like entertainment after dinner. I see you late diners, and I hear your objections. But for me early dining it is. 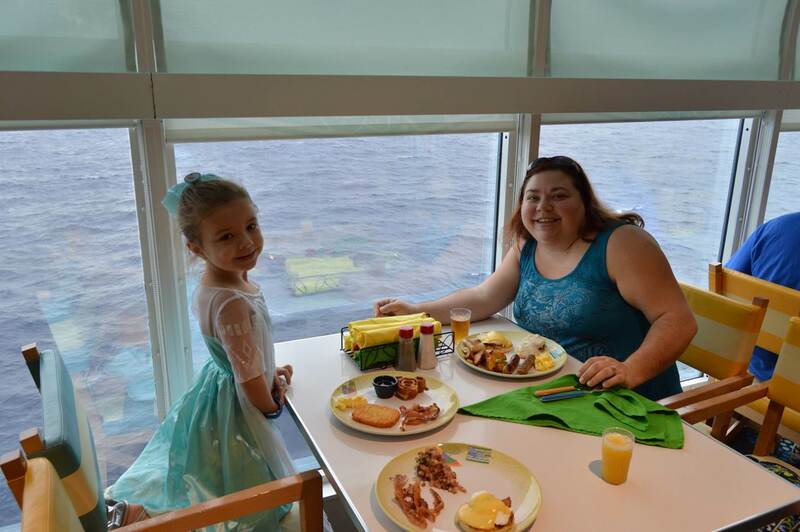 As we cruise we will update with our reviews of each dining location…stay tuned! The second most stressful thing for me (after embarkation) was what to pack. And what not to pack for that matter. You may read on other blogs that they packed way to much, and that you should make an effort to not over pack. I agree and disagree all at once. Let me start by saying, I am not an over-packer. There are people in my family, who shall remain unnamed, that definitely fall into the category of over-packer. I know what these people look like, HUGE suitcases filled to the brim, 6 different pairs of shoes and emergency items for each person in the family, I am not one of them. However, a cruise is unlike any other vacation we take. I found packing to be challenging. Swim Wear – bring multiple bathing suits for each person. I suggest bringing at least 2 swimsuits per person. One will dry, while you are using the other and so on. We changed our clothes every evening for dinner. This is not a requirement, but we were ready for showers and a change of clothes after being in the salty air all day. I would say 75-80% of our fellow travelers changed their clothes for the evening meal. Here is Disney Cruise Lines thought on the matter. Many of the things on this list I thought were totally ridiculous when I read them before our cruise. I am telling you, these are NECESSITIES. There is nothing on this list that I would even consider leaving at home on our next cruise. Water Bottles – I was nervous about the water on board. I was worried it would taste “off”. I am happy to report that it in no way tasted bad. Next trip I will only pack water bottles, and leave the bottled water at home. We filled these at the soda fountains and then took them ashore during our excursions. Cups with lids – I highly suggest bringing larges cups with lids for everyone in your traveling party. You could use your water bottle for this as well. The cups that are provided at the soda fountain are very small and have no lids. It is nice to fill up your own cup and be able to have that wherever you go on the ship. If you have been to WDW, refillable mugs work great for this. Nightlight – This is one of those tips that I simply did not listen to. We got very lucky and one of our awesome FE participants gave us one the first night. We used it the entire trip. Our little one is not afraid of the dark, but the inside stateroom is pitch black and it is impossible to navigate without a light. Leaving the bathroom light on is an option, but a nightlight is better. Watch – We don’t wear watches, we have our cell phones. And again going into the cruise both my husband and I laughed at the suggestion that we would not be carrying our cell phones around. Think again! Unless you are using your phone for your camera, there really is no need to carry it. Luckily, I listened to this piece of advice and had a watch. There are no clocks on board (that can be easily seen). And there is a schedule to keep! Clothes Pins – This seems like a silly one. But drying those swim suits can be an issue. There is a clothes line in the tub, but the clothes pins allow you to hang the swim suits up better and dry more quickly. Snacks – You will not need a ton of snacks. But I do suggest packing a few. We used them when we went ashore and it was handy to have them during the excursions. They saved us from spending money while ashore and allowed us to wait until we were back on the ship where food is included! Lanyards – Another suggestion that I ignored. I mean honestly who wants to be a dweeb wearing a lanyard. I haven’t had one of those since I turned 16, in 1998 (ugh 98?!). Again I was saved, because I am a sliver club member I received a lanyard from DCL at check-in. I used it every single day. I don’t know what I would have done without it. For men it isn’t such a big deal, although my husband was jealous. But I spent most of my time in outfits with no pockets, sundresses, swim suits and so on. Having the lanyard to hold my key to the world card was crucial. Door Magnets & Decorations – This is so much fun and I suggest taking part. Show your personality, hometown, sports team, whatever you are passionate about. It is fun for you and it is fun for your follow passengers to see as they are walking down the hall. Sunblock – And lots of it! Reading Materials – If your kiddos are in the kids clubs there is plenty of downtime. And what better chance will you have to catch up on your reading? Gallon Ziploc Bags – This is a must pack item for me on any trip. I pack tons of things in the Ziplock bags and then use them throughout the trip. They are good for snacks, water, extra clothes and on and on. Towels – Of any kind. There are plenty of beach towels all over the pool decks. And as you disembark you are given towels if you need them for any of your excursions. Shoe Hangers – you may see these are a tip on other blogs. But please be careful, you cannot use them over your bathroom door unless they are modified. You can google how to modify them, but be careful that you are following the rules. We had plenty of storage in our 169 square foot room room, lol. Toiletries – The next time we go I will not be packing shampoo, conditioner and body wash. The products on board are amazing, they are spa quality. Hair Dryer – There is one on board, and I am happy to report it does dry your hair! Power Strips – This is another tip you may see floating around the internet. Outlets will be an issue, and a power strip would be great. But it is not allowed due to it being a fire hazard. 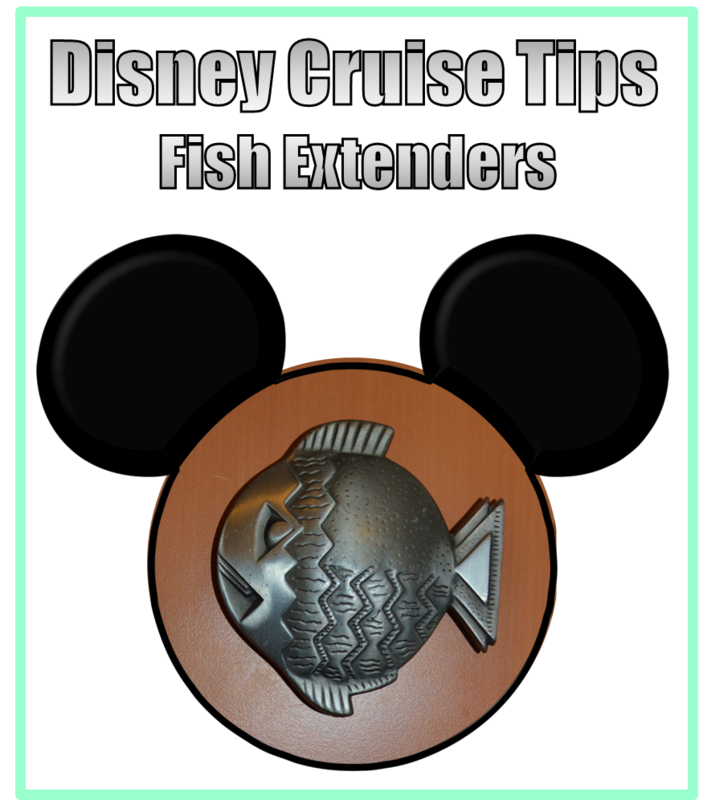 If you have done any research on the Disney Cruise Line thus far you may have come across the term Fish Extender, or FE. You may have also read about it in the blog post Need to Know Secrets. 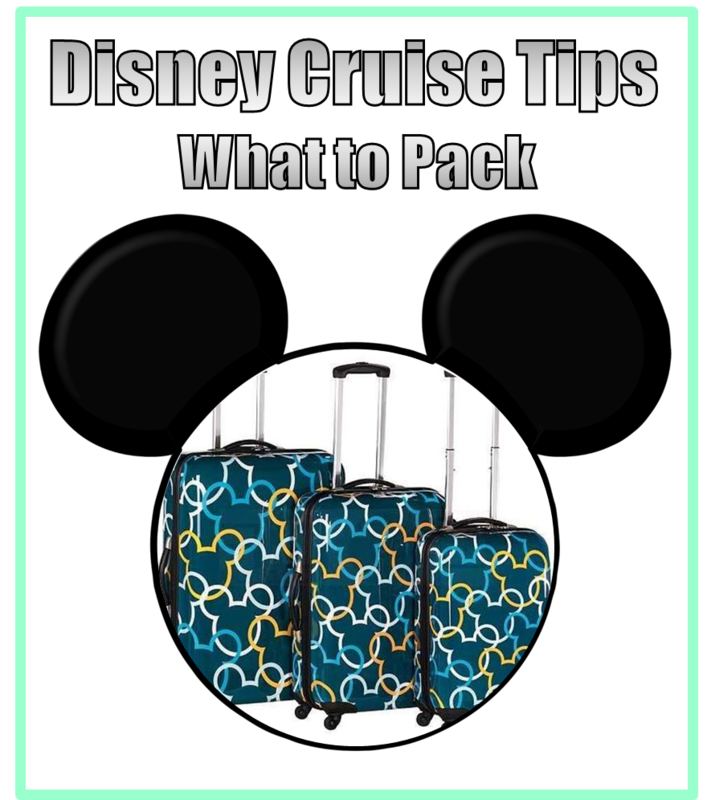 We are here to shed some light on this Disney Cruise tradition and help answer the questions you have about the Fish Extenders. The fish extender stems from the on deck mail delivery system that DCL put into place. 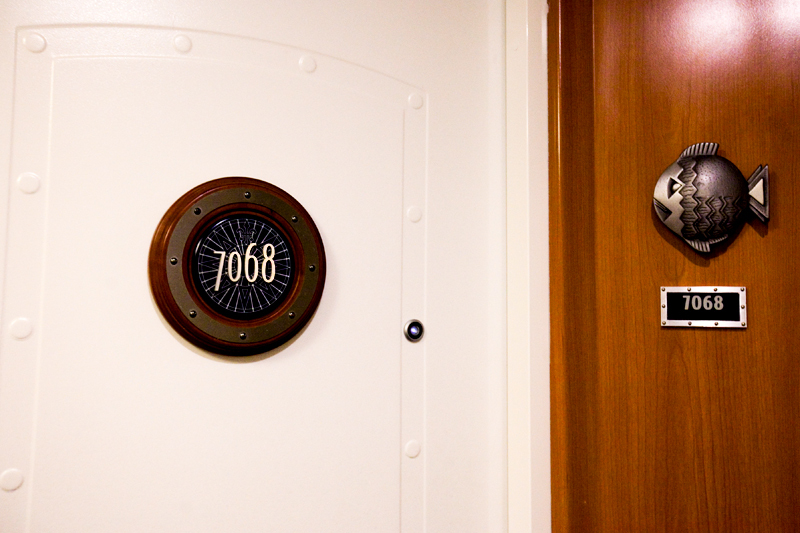 Each stateroom has a fish, which is a decorative clip to hold important information. This could include spa appointment confirmations, excursion details, disembarking times and your Personal Navigator (although ours was always inside our stateroom waiting for us). According to legend the first cruise that featured a Fish Extender was a Disney Vacation Club group on a 2005 cruise. Shortly before this, online groups started arranging meet and greets, events and gift exchanges creating a group of friends before they were even on board (DISboards has long been the place for these types of meet groups). It was at this point that some brilliant Disney fanatic realized that you could leave your gift hanging from the fish, and the fish extender was born. This is a very much homemade affair, but if you are not crafty (like myself) search Etsy for people who are. We love ours! Along with your door magnets, they make your room easy to spot and they serve as a location to receive all the wonderful gifts that your follow passengers will bring by throughout the cruise. Here is the most important thing, you MUST sign up for an FE group in order to participate. If you do not sign up, your fellow cruisers will not know that you are bringing gifts or expecting them. You will be very disappointed when you receive nothing in exchange. Please do your homework and find your group. Start with the DISboards, and find your Meet and Greet. Read through the thread and you will quickly begin to catch up on what has been happening in your group. Then look for your Facebook group (DISboards does not allow a Facebook link to be added to your Meet and Greet thread. If one is posted they will immediately remove it). Search under groups, names are typically formatted as Disney – ship name – date, example Disney Fantasy September 10, 2016. Much to the dismay of DISboards, I have found that most of the Meets are taking their planning to Facebook. Once you find your group you will be able to sign up for the Fish Extender on your particular cruise. Remember, this is a non-sanctioned activity and is run by fellow cruisers. Each cruise has their own separate rules and ways of doing things. Typically there will be multiple Fish Extender lists and a cutoff is determined for the date and number of people that can sign up. Our previous cruise had 15 staterooms per group, this was a LOT because remember you are to give a gift to each person within the stateroom. Our upcoming cruise has limited each group to 10 staterooms per FE group and is up to 7 groups! Gifts range from handmade, prepackaged, practical or just plain awesome. They come throughout the cruise and throughout the day. We loved coming back to check our “mail” to see what cool things came that day. Should We Really Do This? Obviously this goes back to personal preference. And there are definite pro’s and a few con’s. Pro’s – The FE’s really add a magical touch to your cruise. It is just as fun for you as it is your little ones. Gifts are tailored to their ages and likes, and there is no need to buy a souvenir because you come home with a boat load of stuff, pun intended. Con’s – That being said for a first time cruiser, especially if it is a short one this may be something you want to hold off on. Planning, packaging, packing, organizing and distributing gifts for up to 100 people may sound like a scavenger hunt and a headache. And to be honest finding 15 different staterooms on a ship the size of the Disney Magic was a scavenger hunt. My advice would be to find your Meet and Greet group, you do not need to be apart of the FE Groups to be apart of the Facebook page. Take some time to look over what everyone is doing and decide if the added magic is worth it to you and your family. You may be just as happy decorating your door and skipping the FE. What Should We Give as Our FE? The gifts range from lanyards and picture frames for the adults, to ice cream toppings for the kids. They can be homemade or purchased. We did gifts that focused on our home state, think Old Bay. Pinterest and Etsy have tons of ideas. Just remember that you will need to pack your FE’s and that you will need to bring home all that you have collected. 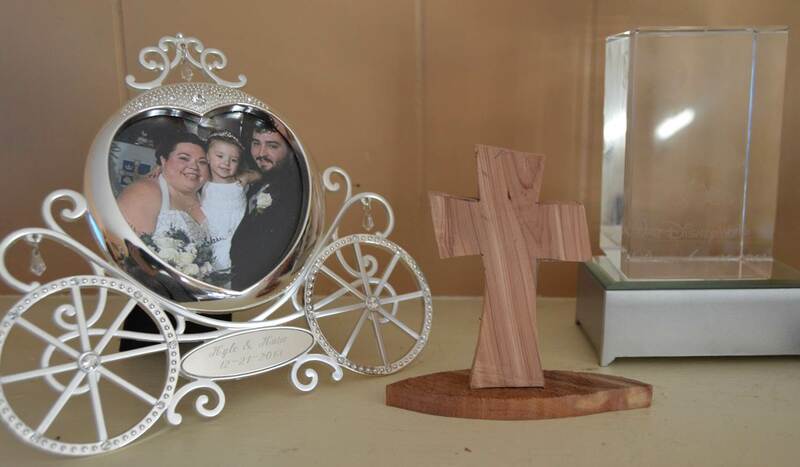 My absolute favorite FE we received was a hand-carved cherry wood cross made by a fellow cruisers grandfather (and no joke they are the Disney family, I am so jealous of their last name). It sits on our mantel, and reminds me everyday of the blessings we have and the memories we made on that trip. Our wooden cross hand carved by the Disney family.